How to download your MP3 audiobook or music to your PC. Step One: To access your download, sign in to DeseretBook.com. After you are logged in tap or click on “My Account” at the top right. Tap or click “Order History” on the left and then tap or click the "Order Details" for your mp3 audio files, and you will see your download listed. The folder needs to be unzipped (takes the compressed file, and makes it a normal file that iTunes can use). 1. Locate the compressed folder that you want to extract files or folders from. Typically for most PC computers, this will appear either on your desktop, or in the 'Downloads' folder which is located in the 'My Documents' folder. o After the process is complete a regular looking folder should appear under the zipped folder. This regular looking folder is the one we will want to move into iTunes. You can now add the files to iTunes to listen on your PC or Apple device. Begin by opening the iTunes and once it opens, you will want to select the ‘File’ prompt from the top-left corner. From the available options that appear, click on 'Add Folder to Library.' A pop up window will then appear asking you to locate the folder that you would like to add to iTunes. After selecting the location of the unzipped folder, iTunes will manually add it to your music library. You can also listen to the MP3 files on any device that supports MP3s. Follow your device's instructions about how to load MP3 files onto the device, and play them however your device requires. 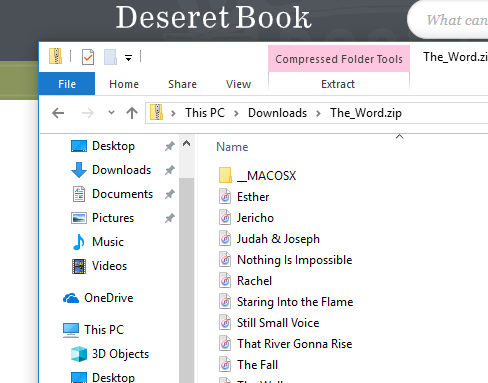 If you experience any technical difficulties or are missing Download links to your purchases, send an email to downloads@deseretbook.com and we can make sure you are able to download your files.